If you’re in Moab and looking for something else to do, drive over to Dead Horse Point State Park. It’s approximately 30 minutes from Arches National Park and about 15 minutes from Canyonlands National Park. It’s a small state park but has some nice views… particularly the potash farms and Colorado River. It costs about $10 to get into the Dead Horse Point State Park. There is the option of purchasing an annual state parks pass. It costs about $75 but will get you into all the Utah state parks. Check their website or talk with someone at the visitor’s center about the pass. Senior adults can get the pass for cheaper (about $35 per year). If you’re interested in camping, the yurts are about $80-$100 and include two beds that sleep up to 6 people (bunk bed and futon). They have a fire pit/ grill and a picnic table. Air conditioning can be found in the room. There are 3 yurts so book ahead of time. Campsites are partial hookups. There are 21 sites and can fit up to 8 people. There is a fire pit/ grill at the sites with a covered table. Check the website for tent size requirements, cancellation policy and availability. Campsites are around $30 during the peak season. There are a couple of trails that are noteworthy. One is around the visitor’s center and the other is about a mile away. Both trails are paved and, overall, flat. Stone barriers surround the trails, preventing people (kids especially) from falling over the ledge. The trails are clean and naturally landscaped. There are picnic areas- some covered- close to the trails… potentially perfect spots for family reunions! In comparison to Canyonlands National Park visitor’s center, the visitor’s center at Dead Horse Point State Park is large. There is an art gallery downstairs, a gift shop on the main level, and exhibits providing information about the park upstairs. There’s also a canteen that sells bags of ice, candy, wraps/ sandwiches, drinks, etc. Their hours may vary due to the season. As silly as it may sound, the restrooms at the visitor’s center and at Dead Horse Point are clean and actually have multiple stalls with toilets that flush… not your average pit toilet in Arches and Canyonlands (and there’s soap vs. hand sanitizer). 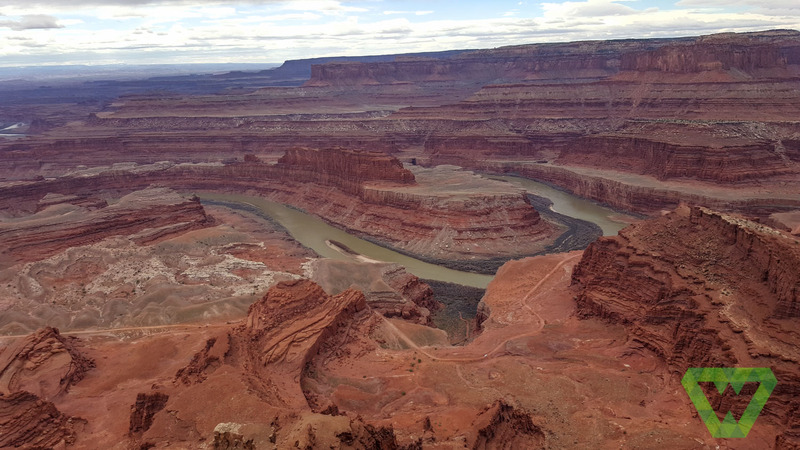 For more information about Dead Horse Point State Park or to book a campsite/ yurt, visit their website at http://stateparks.utah.gov/parks/dead-horse.